Pozdravljeni v prvem izzivu v letu 2019 pri Colour Crazy. Tokratni sponzor je Ching Chou Kuik s svojo prekrasno zbirko sličic. Kdor rad barva, mu sličice ponujajo obilo priložnosti za zabavo in sprostitev. Tudi v letu 2019 lahko objavite karkoli želite, le da ima izdelek lastnoročno pobarvano sličico. Welcome to the first challenge at Colour Crazy in 2019. For my product, I used the Ching Chou Kuik sponsorship stamp and coloured it with Prismacolor Penciles. 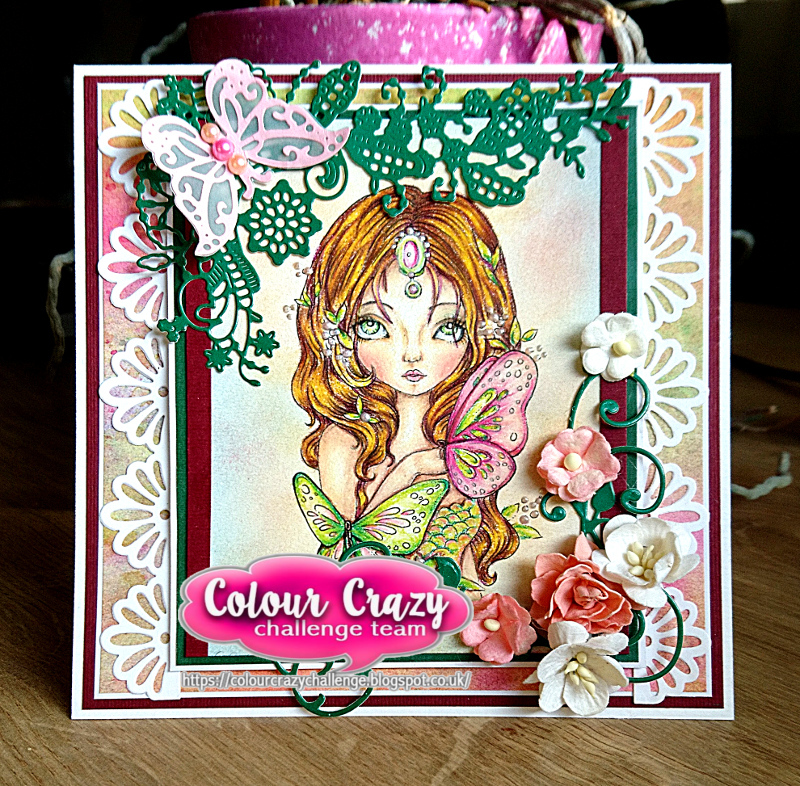 Clasic DT open Challenge: #1, ATG - Jan.
A fabulous card, such a beautiful image and lots of super details. Beautiful!Great papers and card design! We would love to have one of your projects submitted for an upcoming issue of the magazine! Thank you so much for entering the challenge at Through The Craft Room Door this week. Looking forward to seeing you again in the next challenge. I am excited about the idea of publishing my card. Just let me know how can I participate. She is beautiful..gorgeous card..Thank you for sharing with us over here today at the Classic Open Design Team Challenge and best of luck with your entry. So beautiful image and you have made it so perfect!!! Love this creation !!! Lovely card! I love the intricate dies you have used to showcase her. Thanks so much for joining us over at As You Like It Challenge!